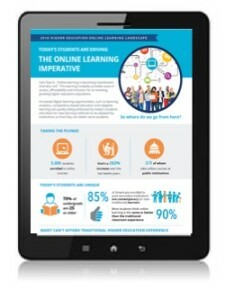 Our featured infographic illustrates the key topics and trends currently driving the infusion of online learning in higher education based on the most current research from across the field of higher education. 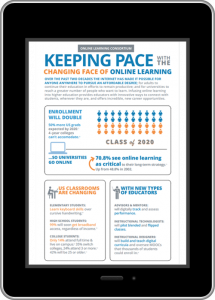 Download our infographic to learn more about our perspective on the changing face of online learning. Our infographics illustrate the key topics and trends currently driving the infusion of online learning in higher education based on the most current research from across the field of higher education. 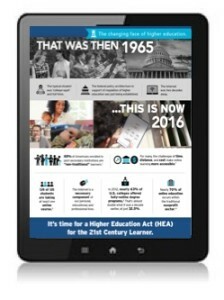 Together with UPCEA and WCET, we collectively address a revised Higher Education Act for the changing face of higher education. Why? Today’s learners are working adults, single parents, military personnel and their families, veterans, caregivers, and others. Classroom-based learning, for them, creates enormous challenges of time, access, and cost. Our federal regulatory system was designed for the traditional students of the past which is very different from the reality experienced by the majority of post-secondary students today. This infographic illustrates the key trends currently driving the infusion of online learning in higher education based on the most current research from across the higher education industry. A growing and aging undergrad population. Rising tuition costs requiring innovative alternatives. An evolving workforce seeking lifelong learning options. Academic leaders strategic focus to develop online learning strategies.